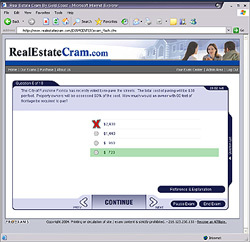 Take Your LIVE Online Practice Exam Now!Realestatecram.com online practice exams are automatically made available to you after purchase. Our online exam testing engine gives you the flexibility to take your practice exams when you want, how you want. Your ExamCenter includes access to all your previous exams, with the opportunity to review your exam. Our system provides you with the areas you need to sharpen your skills in, along with detailed question explanations to reinforce your learning experience. Use the menu on the left to review all of the study exams that we currently have available for Florida. Remember, each full exam that you purchase will give you hundreds of professionally written questions, in our interactive exam engine. Learning becomes easy, when you see questions designed after the actual license exams, in our easy to use flash question interface. Not sure yet, try a FREE EXAM.